A Brand New Adventure on Lake Taneycomo! A fascinating jet-boat ride in Lake Taneycomo is one of the newest Branson attractions that is great to enjoy with the whole family this summer 2017. Branson Jet Boats is a brand new water adventure on the lake which offers visitors an unforgettable water ride experience on the clean waters of Lake Taneycomo. This jet-powered boat departs from Branson Landing, a great shopping destination in the Midwest, and will take you up and down the lake where you will get to enjoy an incredible combination of picturesque scenery and full 360 spinouts, power stops and excellent expertise of maneurability executed by the top notch captain. 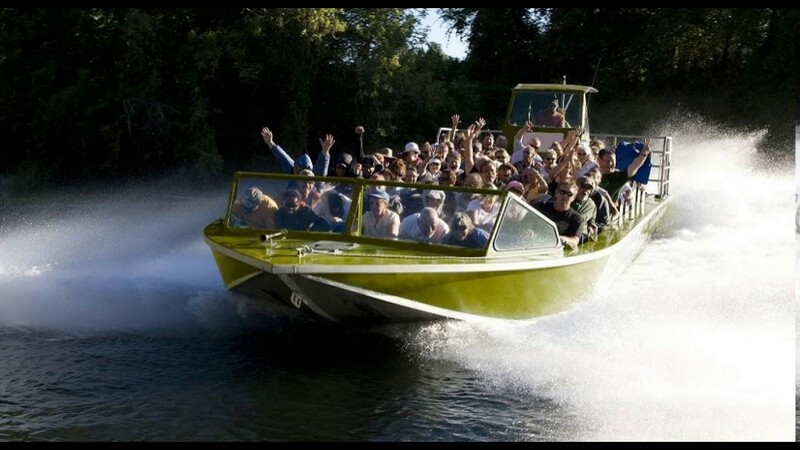 The jetboat adventure will start from Branson Landing and will bring you to an exciting ride experience in beautiful Lake Taneycomo in the heart of Taney County, Missouri. When the dam at the White River was constructed in 1913, it created Lake Taneycomo. The characteristics of the water in the lake depends on how much water is running through the dam, it can be calm or fast moving, so guests will always have a slightly different water adventure every time they come. This thrilling water adventure on the lake is fun for the whole family. As you get to experience this great water adventure with the jetboat, you’ll not be wondering what you’ll see as you start the journey. The jetboat has a guide to help you enjoy all the fun and excitement the Ozarks have to offer with advantage of gaining knowledge about the area as compared to any water attraction in Branson. This great water adventure ride with the jetboat can help you cool off during a hot summer day. This brand new water adventure on the lake is perfect for any water enthusiast. As the jetboat travels in full speed you’ll feel the air snaps your face and the water sprays from the boat which create an unforgettable memory of your summer getaway in Branson. Once you’re aboard the jetboat, the knowledgeable tour guide and the experienced captain will make ready to start the water adventure on the lake, pulling out into the main channel of Lake Taneycomo for a great jetboat adventure up and down in one of the most beautiful lakes in the Ozark region. As the jetboat ride adventure is about to start, you’ll get to see the spectacular view of Branson Landing waterfront as you leave the area and then race down the lake and see fascinating wooded hills on the lakeside, beautiful scenery, and unique wildlife. This great water adventure with the jetboat lasts about an hour. As it cruises the lake, the captain will give a little narration about the history of Lake Taneycomo including details about local scenery and wildlife as well as other stories about the area. As the captain continues to narrate, you can’t help to appreciate the breathtaking scenery. A brand new water ride adventure with Branson Jet Boats is a new water activity that can surely be enjoyed by any water enthusiast this summer 2017.